Earliest UFO sighting on record? sky the first known sighting of an Unidentified Flying Object, or UFO. Visual case reconstruction by David Sankey of the craft witnessed by Mr. D. Mc Murray and family while driving home across Bagshot Heath, Surrey, to Farnborough, Hampshire. The craft was observed hovering above the road at 9:03 p.m. on Sunday 15 th Sept 1985, estimated to be approximately 50 ft wide with a depth of approx 5ft. Self confessed sceptic thinks there is a cover up! This item should be read in conjunction with “Abductions”. Reporter Geoffrey Wansell who describes himself as a sceptic, and did not believe in aliens and UFOs, now thinks that there is case to answer- that something has been covered up. The question is how many more sceptics are going to become 'open minded'? After 50 years of ridicule, denial and cover-up, is the real truth about alien abductions about to be revealed? by Geoffrey Wansell. On a hot, sticky July afternoon in 1987 Jason Andrews is celebrating his fourth birthday at his family's cottage near Slade Green in Kent when the heavens open. As the thunder crashes all around, there is a single flash of lightning. Suddenly, a stream of numbers starts pouring out of Jason's mouth: fantastic numbers, complex mathematical equations, even algebra - all from a boy who struggles to count to ten. Seconds later the windows and doors begin to shake violently and the four-year old announces to his mother, father and elder brother: `They're waiting for me. I have to go.' Jason's father, Paul, grabs his son and stops him from walking out into the downpour, but the boy struggles violently, and as he does so the house shakes to its very foundations until, finally, he seems to wake from a trance and the shaking stops. It is the first sign that Jason Andrews is no ordinary little boy and, in the eight years that follow, that is dramatically confirmed. It wasn't until 1995, when he was almost 12, that Jason told his astonished parents exactly what had been happening to him - aliens had been abducting him from his bed at night. It's always the light that comes first,' he confessed to his mother, Ann. `Then I see the tall one rise up at the foot of the bed. Suddenly there's lots of little ones everywhere. They're fuzzy and indistinct, and they move very fast. I can't move or speak, but I'm awake and I can see and hear and feel. I want to scream and run, but the sound doesn't come out and my body doesn't move. I hate them. I hate them,' the boy sobbed. `I have to go with them. They take me to an operating theatre, like at the hospital. It's all white and shiny Sometimes it's a circular room with It's always cold. They're there. The big one touches me but I don't feel it, like as if I've had an anaesthetic.' Then he added poignantly: `But you don't believe me, you just think I'm making it all up.' In fact, Ann did believe him, and went on to explore the phenomena affecting her son's life in a hook, Abducted. This decent, uncomplicated wife and mother came to the conclusion that we may not be alone. Now, the rest of the world may be about to agree with her After five decades of ridicule, official denials and alleged cover-ups, the possibility that aliens. may have visited Earth is beginning to be taken seriously - and not just by sci-fi fanatics and UFO freaks. Scientific researchers are increasingly convinced that thin, grey-skinned beings about 4ft tall, with large almond-shaped eyes set in an oval, hairless, head, may not only have landed on earth, but have also abducted human beings for bizarre experiments; while all the time there has been an official conspiracy to keep their visits secret. Tonight American filmmaker Steven Spielberg, the man who brought the world Close Encounters Of The Third Kind and ET, will bring those convictions - and aliens - to life in his new mini-series, Taken, on BBC2. A cunning mixture of. fact, conjecture and fiction, based on the latest research, it tells the story of how aliens affected the lives of three American families over the past half century. A massive hit in the U.S., where it was broadcast on consecutive nights last month, Spielberg's series is the most expensive TV science faction drama ever made - with a budget of more than £25 million - and it's certain to re-ignite public debate on this forever-contentious subject. But surely all this talk of aliens is far-fetched? As a natural sceptic, I've always believed so, but over the past weeks and months of reviewing the evidence I've come to the conclusion that it does, in fact, warrant the closest investigation. There certainly seems to have been an official conspiracy to keep the facts secret. In the past few months, for example, firm evidence about unexplained events connected with Unidentified Flying Objects (UFOs) and extraterrestrial phenomena has begun to appear for the first time as governments around the world have released previously secret documents. And, for the first time, politicians have started to admit that evidence on the possibility of extraterrestrial life has been concealed. In October last year, for example, former White House Chief of Staff John Podesta, who worked for President Clinton, called on the U.S. government to de-classify `records that are more than 25 years old' and `to provide scientists with data that will assist them in determining the real nature of this phenomenon'. Only four years ago, former Prime Minister Baroness Thatcher hinted to British UFO researcher Georgina Bruni that there was considerable secret information on the subject, adding mysteriously : 'You can't tell the people. 'Bruni was so struck by the remark that she used it as the title for her 2001 book on alien sightings in Suffolk in 1980. Shortly afterwards, former Tory Secretary of State also confided to her on the subject: 'I know a lot, but I tell a little.' After a campaign by Bruni and other researchers, the Government last month released scores of secret files on UFO sightings in this country, all of which suggest that aliens can no longer be dismissed merely as the product of fevered imaginations. Certainly the majority of the public now seem to believe that aliens do exist. As the editor of the British UFO magazine, Graham Birdsall, points out: `Sixty years ago, 90 per cent of the population thought the idea was "absolute rubbish". Now every single opinion poll on the subject shows that millions of people firmly believe in UFOs. 'Last June, for example, when it was announced that Bonnybridge in Scotland boasted more UFO sightings than any other place in the world, a Sky News poll showed 65 per cent of its viewers believed in UFOs. Five years earlier - in one of the biggest telephone polls ever conducted on TV - 100,000 viewers phoned ITV to answer the question `Have aliens already visited Earth?' and 92 per cent voted `Yes'. There's strong evidence to suggest that Earth has been visited by extraterrestrial intelligence,' insists Birdsall. And after my own research I am prepared to admit that it is no longer possible to dismiss people such as Birdsall as `cranks'. Spielberg, whose film Close Encounters Of The Third Kind dramatically raised the issue of alien encounters for a global audience, is certainly convinced they've happened. Fascinated by the possibility from childhood, he's devoted part of his life to discovering the truth and has become an authority on the subject as a result. But there is a striking difference between Spielberg's approach in his TV series Taken and the one he took two decades ago in Teethes time the aliens he is . depicting are not trying to phone home they're here to subvert, and ultimately control, the human race. And the new TV series, his first since the award-winning Band Of Brothers, is not only about the arrival of aliens, it's also about `alien abductions'. I thought I couldn't do justice to this genre in a two-hour movie,' Spielberg explains. The 100 or so people I interviewed about being abducted by aliens weren't publicity seekers merely after their fifteen minutes of fame,' he explains.' I came to the conclusion that some of these people had to be telling the truth. And if just one of the abductees' reports is true, the implications for the human race would be profound and disturbing.' One person who helped to convince Pope was 37 year old British - born make-up artist Bridget Grant, whom he met seven years ago. She addressed an audience of 750 people at the British UFO conference in Leeds in 2001, where she talked about her abduction. She explained that in February 1993, when she was living in Los Angeles; she was driving with a friend in the Brentwood area at 5.50pm one bright, sunny day when she drew up at a set of traffic lights. I suddenly saw this silver tip out of the corner of my eye,' she explained. `Then, I saw that it was a solid silver craft, with a red-orange colour underneath it, about 35 - 45 ft in diameter. It came right above the car and I leaned towards the steering wheel and looked up.' The craft `flew really, really low' over her head, she said, and away to the west, Her friend Jane, sitting in the passenger seat, saw it, too. Grant was so disturbed by the experience that in September 1998 she went to see the American UFO researcher Budd Hopkins, of the Intruders Foundation in New York, to undergo four sessions of `regressive hypnosis'. .She wanted his help to remember the exact details of what happened on that afternoon in 1993 because she thought she had forgotten something. It appeared that she had. For when this pale young 'woman, with shoulder length dark hair; addressed the Leeds audience she told them she'd not just seen the spacecraft but had been abducted by it, even though she thought she was in her car the entire time. There is often a time shift element in the stories of abduction, where the individual doesn't realise that time. has passed,' explains Nick Pope. My hands were gripping the steering wheel,' Grant explained to the conference. `But then I felt a pressure, like my body was being sucked. It felt like all the atoms of my body were going through the steering wheel.` Then I saw this being. I was fascinated by its appearance - it was transparent, had white hair and was carrying a baby.' Hard though it may be for some to believe, and Grant is reluctant to discuss the events further, ``there is no doubt that the artists' impression of the being which she said she saw looks uncannily like many of the other descriptions of aliens that have surfaced in recent years. However, as sceptics point out there have been so many depictions of 'space creatures' with dome heads and large oval eyes that it is hardly surprising that this has become something of a stereotype. When Spielberg was researching the aliens for Close Encounters, he held lengthy consultations with the veteran American astronomer Dr J Allen Hynek - a once- fierce critic of UFOs and alien phenomena who changed his mind completely after he became a consultant on the subject for the United States Air Force. Hynek assembled the authoritative American dossier on alien encounters, Project Blue Book, and advised Spielberg what aliens looked like. But the idea that little grey - rather than green - men with elongated fingers, legs and neck, sounds incredibly far-fetched - until you talk to Georgina Bruni. `When I interviewed Lady Thatcher a few years ago,' Bruni explains, 'I was describing to her the fact that US military personnel here in Britain had reportedly had contact with, aliens, and an alien spacecraft, in Rendlesham Forest in Suffolk in December 1980. I expected her to tell me that I'd been watching too many episodes of the X Files, But she didn't look shocked at all. She just said, twice: "You can't tell the people." With Bruni's encouragement, in the wake of this conversation Lord Hill-Norton, a former Chief of the Defence Staff tabled 18 Parliamentary questions in the House of Lords -as a result of which the Government released more than 200 previously secret files concerning UFOs and aliens. One of the files revealed that then Prime Minister Sir Winston Churchill wanted the matter investigated in 1952.He sent a memo to his scientific adviser, Sir Henry Tizard, asking: `What does all this stuff about flying saucers amount to? What can it mean? What is the truth?' After several months, Tizard reported that all the sightings were 'explicable by natural events, although shortly afterwards the Government explicitly banned RAF personnel from discussing sightings with anyone not from the military. The U.S. Government had adopted a similar policy of official secrecy five years earlier, in the wake of a spate of incidents near the US Air Force base at Roswell, New Mexico, in July 1949 - incidents that Spielberg uses as his starting point for his TV series. And so the modern history of UFOs, aliens and official cover-ups was born. British UFO researcher Jenny Randles, who has spent more than 20 years investigating UFO and alien phenomena, maintains that in more recent times alien kidnapping has become much more common, An ever growing tide of people suspect that they may be alien abductees,' she says. So is it fact or fiction? I'm not certain, but the evidence of witnesses such as Jason Andrews and Bridget Grant is hard to ignore. And it's clear that, as the 2lst century begins, opinions are changing. The Government announced recently that it was `open-minded' about the `existence or otherwise of extraterrestrial life forms' a markedly different official position from the one taken half a century ago. Perhaps the politicians are beginning to accept that we are not alone. Steven Spielberg certainly does. 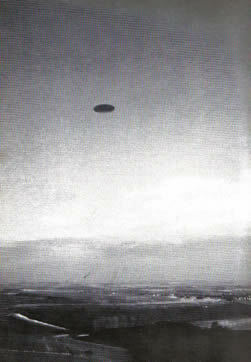 "Unknown object" photographed by Rod Dickinson as it flew over Gould's Hill, Dorset (UK) at 11-00a.m., 21st December 1993. A top BBC executive let slip recently that there is a "D-NOTICE" on media reporting of "black triangles". The executive, who cannot be named, is the former producer of a very popular BBC science programme. Black triangles were first witnessed in the Hudson Valley region (USA) by hundreds of people (mid 1980s) and have since been seen by thousands of people in Belgium. Seemingly the craft has been heavily "D-NOTICED" by the UK Government , restricting media reporting regardless of how many witnesses reported sightings. According to the former producer the Government has informed the BBC that the craft is a secret military project but if so why is it witnessed over residential areas? Nick Pope, acknowledged UFO Investigator , maintains it is highly unlikely to be a secret military project. Its technical capabilities and flight behavior suggest it neither belongs to any Earthly Government o falls within the envelope of Human Technology. Perhaps the UK Media are being warned away from reporting a fairly obvious example of "alien" craft intruding with impunity into British Airspace. UFO caught on close circuit television in the South of England. "It is my view that this (UFO) situation has possible implications for our national security which transcend the interest of a single service"